Let the adventure begin! We’ll collect you from your accommodation and start the tour in the coastal town of Bicheno. 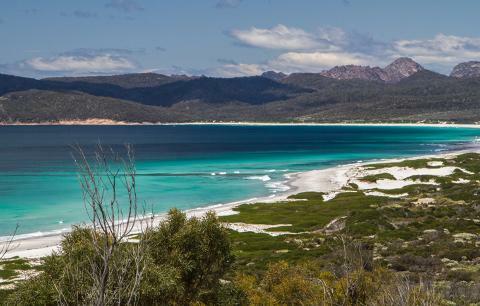 We kick the 4 wheel drive into gear and venture to the unspoiled Freycinet National Park, a truly spectacular place not readily available to your everyday tourist. 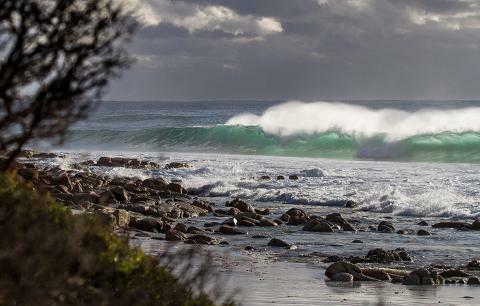 The first port of call will be a stroll along Friendly Beaches North, a gorgeous stretch of beach recently named amongst Tasmania’s 60 Great Short Walks. We’ll meander down the pigmented granite rock, flanked by nearby Bennett’s Wallabies and with Fairy Terns soaring overhead, before exploring the secluded bays, leaving nothing but footprints in our wake. Next up, we return to the paved road and enter the diverted tracks lining 63km² of lagoon and marsh lands known as Moulting Lagoon. Bask in the natural beauty of the crystal beaches, granite mountains and diverse terrain that is home to an abundance of native wildlife. This is the ideal spot for bird watching; boasting 98 types of birds, including traditional Tasmanian staples the Black Swan and the Pied Oystercatchers. 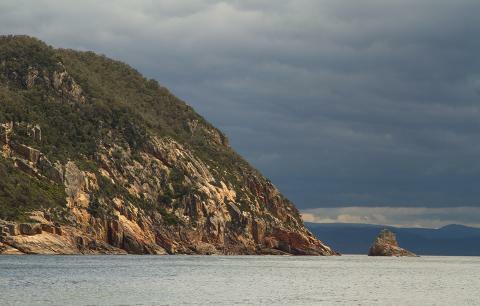 Trivia Time: Freycinet National Park was founded in 1916 and named after Louis Freycinet, a French explorer. It is the oldest National Park in Tasmania, alongside Mount Field National Park which received its title on the same day. Once back in the Park, we continue our quest off the beaten track towards Friendly Beaches south. 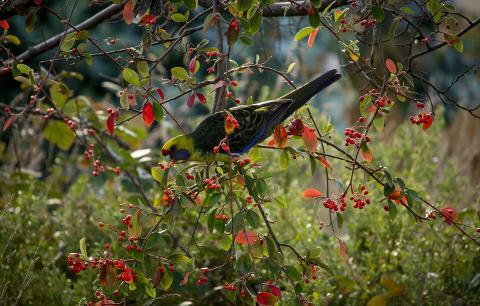 With 49 endemic species and over 500 plant types found in the Park, there will be photo ops aplenty. 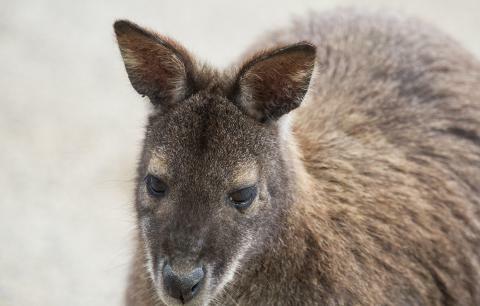 Be sure to keep an eye out for the native Echidna, Wallaby and Wombat on the ground, or turn to the skies to see the White-Bellied Eagle soaring overhead. After cranking up the 4 wheel drive to journey through the native Eucalyptus forests, we arrive at the wondrous Whitewater Wall and Bluestone Bay. Bluestone is a stunning secluded bay, bathed in rounded blue granite boulders that sharply contrast the more conventional pink granite of the area. Time seems to stand still as the peace and splendour of this natural wonder washes over you. With your tummies satisfied and batteries recharged, we resume our march towards the famous Cape Tourville and its charismatic, unmanned automatic lighthouse. Stand on the boardwalk and marvel at the sheer enormity of the Tasman Sea and the vast, awe-inspiring Tasmanian coastline. The possibilities appear endless as the eye meets Carp Bay, drifts towards Thouin Bay, and finally catches a glimpse of the stunning Wineglass Bay. If the timing is right (and we will try our best to make sure it is! ), you may catch a glimpse of a mother Southern Right Whale and her calf as they make their journey along the coast. 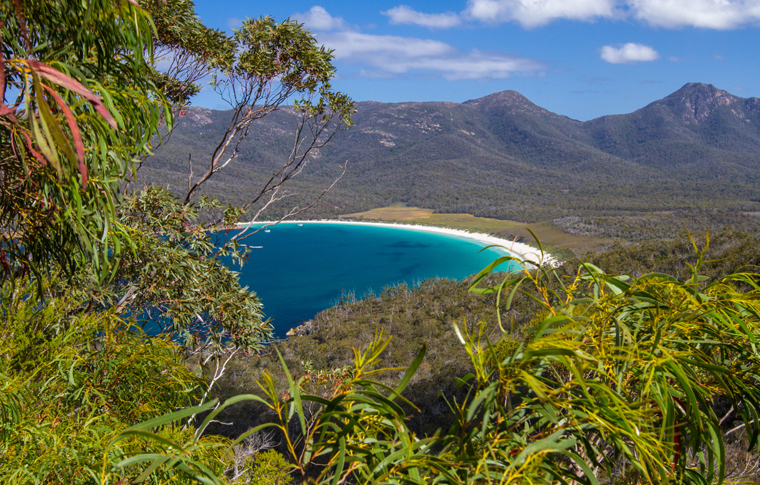 Having witnessed Wineglass Bay from a distance, it’s now time to experience it firsthand! A regular feature on ‘Top 10 Best Beaches’ lists, this is well worth the wait. 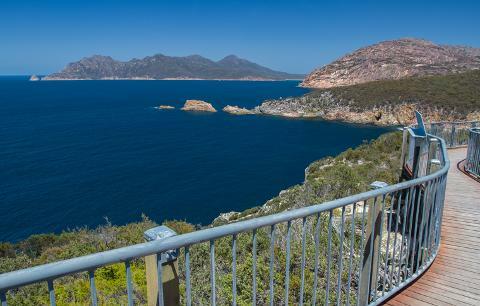 We will embark on a short one-hour return walk through the saddle of Mount Amos and Mount Mayson before arriving at Wineglass Bay lookout. Rest assured, this is truly one of those once in a lifetime, never forget moments. As the afternoon unfolds, we meander our way through Freycinet National Park and pay a visit to the iconic Honeymoon Bay before relaxing under the afternoon sun with more authentic Tasmanian aperitifs and wine. We recommend a refreshing dip in the freshwater of Great Oyster Bay to wash off the day’s indulgence – but the choice is very much yours. Once all dried off, we start our journey home, stopping off along the way to capture any last mementos that emerge.